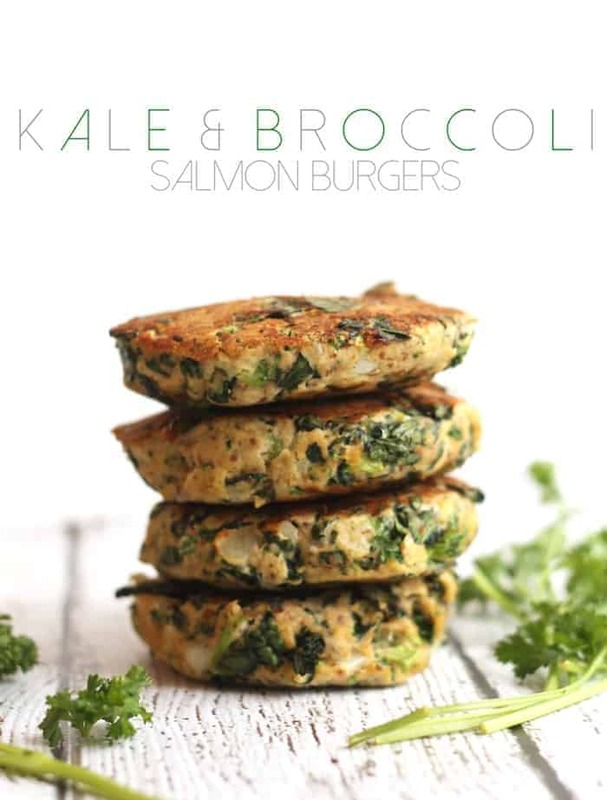 Super easy, delicious, and healthy wild Kale Broccoli Salmon Burgers packed with flavor and veggies. If you don’t have time to workout, just change your sheets. (We’ll get to the healthy salmon burgers later, don’t you worry). I mean can you think of a worse feeling than coming home from a long day of eating all the food to find a sheet-less bed? No, no you cannot. Except when your socks fall off in your boots. That may be even more dreadful than a naked bed. I enjoy putting clean sheets back on my bed about as much as I enjoy cleaning three-week-old green smoothie stains off the kitchen cabinets. Why is it so hard?! It’s exercise. It’s guaranteed that my first three attempts at getting the fitted sheet on all four corners correctly will fail. Then I’ll actually consider that the fitted sheet doesn’t fit, even though I sleep on it every night. IF IT WOULD JUST COVER THE CORNER COMPLETELY. I always get really sweaty. At first I snuggle my nose in the sheets and appreciate the warm lavenderness that is their token aroma, but ten seconds later I’m perspiring over the thought of having to actually clothe the bed with then. You’d think I would have back up sheets. I do not have back up sheets. My birthday is May 8th. So what does changing my sheets have to do with veggie-packed salmon burgers? Absolutely nothing, except that I love these guys as much as I hate my sheets. That’s a lotta love! Maybe you should whip these healthy salmon burgers up while your sheets are in the drier so you’ll be in an extra good mood when it’s time to put them on your bed. The sheets, not the salmon burgers. Super easy and delicious wild salmon burgers packed with superfood veggies. Place drained salmon in a large bowl (I remove the skin and bones, but that’s optional). Add eggs, almond meal, lemon juice, salt, garlic powder, and pepper. Stir well to combine. Add in chopped veggies. Be sure they are chopped into tiny pieces because the burgers will fall apart if there are large chunks. Mix well (I used my hands). Form into 5 tightly-packed patties. Place on a plate lined with foil or parchment paper and refrigerate for at least thirty minutes. Once refrigerated, heat a large skillet sprayed with oil over medium heat. Once hot, add burgers. Cook for 5-7 minutes per side, or until browned. 1) We are on the same wave length as I totes have a broccoli burger recipe planned aaaand 2) I hate changing my bed sheets and don’t do it often enough. ….one day I’ll be an adult…until then, UGHHH bed sheets. Yayyyy for broccoli and all the laziness and crumply sheets! This looks so yummy! And believe me girl, you don’t know the pain of changing sheets until you’ve put your bed in a corner! I have to crawl on the bed to tuck in the sheets on the side again the wall…which just makes the opposite corner pop off! It’s a nightmare. I feel your pain…my bed is in a corner, too! Worst decision EVER. Why don’t you change bed-placing? My bedroom is very small. There’s really only one place to put it. Haha omg I hate when my socks comes off inside of my boots! I thought I was the only one who had that problem. You are NOT alone!!! It’s the worst. These look great! Yes, getting sheets on can be so annoying! Do you think I could substitute chickpea flour for some of the almond meal? These look great! And yes, getting sheets on can be so annoying! Do you think I could substitute chickpea flour for some of the almond meal? Hmmmm I don’t see why not! Oh my goodness do these look good! LOVE. Putting clean sheets on my bed is my least favorite activity too!! Like, the clean sheets just sit crumpled on the floor for 3 to 4ish days until I work up the ah-dultly motivation to put the dang things on the bed. Just.ridick. One day we’ll be filthy rich and have someone clean our beds for us, deal? OMG same. I hate a crumply sheet but I always have crumply sheets because –> #laziness. I’d die for a personal bed sheet-er. I’ll share! LOL I hate when my socks fall off in my boots!! I can handle clothing my bed quite well though, it gets me sweaty too but it always works nonetheless! I’d appreciate a salmon burger afterwards though! OMG the duvet is most definitely my worst nightmare. I couldn’t even tell you the last time I washed it! That’s embarrassing. I am so stinkin’ excited about these!!! Now that I am pretty new to seafood, I always get crazy pumped when I see recipes that involve salmon. It is my favorite! You’re gonna be in lalalala love! I give you permission to eat one on a rice cake. With a pickle, duh. Seriously why are fitted sheets so much trouble!? Impossible to put on the bed and folding them… well, forget it! You’d think someone would have invented a better option by now. Anyway, these burgers look delish! OMG folding them is a beast in itself! I JUST USED THIS AS A REASON TO NOT GO OUT WITH MY COWORKERS because I had washed my sheets before work (and left them for later) and didn’t want to come home to a bare mattress!!!! They thought I was crazy. So glad I’m not alone!! Bahahaha I’m LOLing over here. YOU ARE NOT ALONE! …When i first moved to sydney, I slept in a sheetless bed for a few days….because I was too lazy. These look insane- I love using canned salmon for patties/burgers! I’d be lying if I said I’ve never slept in a sleepless bed. I actually had two sets of sheets for my bed. I only used one because I just throw it in the washer/dryer put it back on the bed. (sorry mom) Turns out the fitted sheet gets threadbare quicker than the top sheet, due to the friction of our bodies all night long. Now, thanks to my fitted sheet giving up the ghost (for the first time in my life – I’ve raised 8 kids!) as I was putting it back on the bed, I now have two complete sets of sheets and one extra top sheet. You are correct – you will sweat buckets, especially if you have a king-size bed! Lovely site you have, found you through MFP. Glad you found me, Kay! I can’t imagine changing the sheets on a king-size bed…holy sweat. What do you use as a bun for the salmon burger? I’m trying to cut out carbs so I can lose weight, so I don’t want to use a burger bun. I used canned wild salmon! Oh baby, I put broccoli in everything but never thought to put it in my salmon cakes. Yum–can’t wait to try this! My friend! AH! Hi! I made these with a cooking class I do in Salt Lake city for people in recovery from drugs and alcohol. I gave them your website for the recipe! Keep rockin it! I had high hopes for this recipe. The seasoning was enough to off-set the kale and broccoli, but these suckers WOULD NOT stick together! I used old fashioned oats and eggs as my binders. I tried to squeeze out some of the water in the salmon before mixing ingredients too. If I were to bake them, do you know what the temperature and cook time would be? Maybe that would help them stay in form.